Believing that sartorial shopping is "an experience built for women" (unless -- shameless self promotion alert! 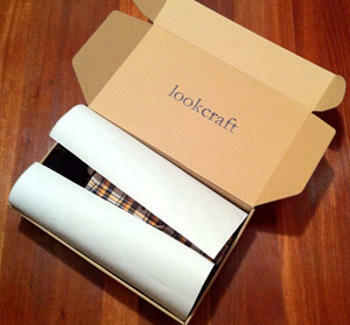 -- you do it with our bros at JackThreads), Lookcraft makes it crazy easy to look great, shipping over high-quality duds hand-picked by legit stylists to your door and letting you return the stuff you don't want for free. First you'll have to complete a quick visual quiz (selecting preferred "looks" from a series of modeled outfits & standalone garments), fill out your physical deets, then betray your lies about not being husky by telling them what brands fit you best. Based on your answers, they'll assign you a "style" (e.g., Preppy, Americana, Classic), and have a stylist e-recommend seven corresponding items, which you can exchange individually for alternate suggestions. Once you finalize what stuff you want to check out, you'll have a full week upon receipt to try it all on, unfortunately an experience they can't stop from being built for women.